We regulate the way we operate using the Nestlé Corporate Business Principles, which form the basis of our culture, our values and our Creating Shared Value strategy. Available in more than 50 languages, all employees must comply with them through the ongoing implementation of relevant business codes, policies, processes and tools. We monitor their application and effectiveness through various channels, including our CARE audits, and have a formal public commitment to provide employees with training on the principles. Our Corporate Business Principles are reviewed by our Executive Board and aligned with international best practice and standards such as the UN Global Compact (UNGC) Principles. The Board of Directors, the Chairman, CEO and Executive Board are responsible for the supervision and management of our role in society, and for the Creating Shared Value strategy. 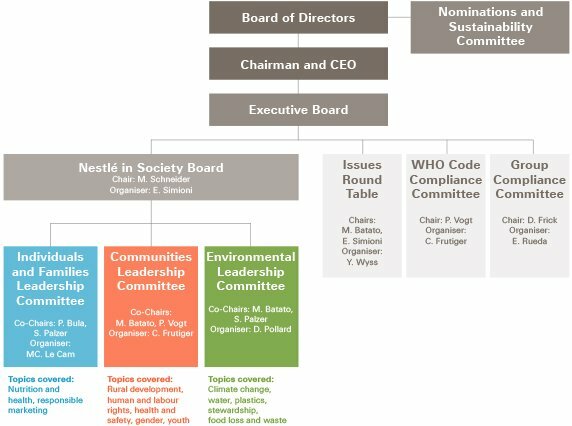 They are supported by internal management bodies such as the Nestlé in Society Board (see below), as well as the Leadership Committees which were put in place in 2017 to drive our ambitions and commitments . The Nestlé in Society Board is chaired by our CEO. It leads the strategic development and implementation of Creating Shared Value across our business, including for all societal commitments, objectives and strategies, and reverts to the Executive Board for input and confirmation. Further strengthen our credentials in Creating Shared Value, environmental sustainability and compliance. The Nestlé in Society Board currently comprises: Mark Schneider, Stefan Palzer, Magdi Batato, Peter Vogt, Eugenio Simioni, Christian Frutiger, Thomas Buday and Patrice Bula. In 2016, we created a new Nomination and Sustainability Committee. This Committee prepares the succession planning of the Board and periodically reviews other measures which ensure our company’s sustainability and how its long-term strategy relates to our ability to create shared value. The Nomination and Sustainability Committee currently comprises: Paul Bulcke, Henri de Castres (chair), Steven G. Hoch and Ann M. Veneman. Our internal governance structure is supported, through a wider, more inclusive approach, with advice from external advisory groups. Chaired by Janet Voûte, the Nestlé CSV Council comprises 11 external members, whose expertise spans corporate social responsibility, strategy, sustainability, nutrition, water and rural development. The group advises Nestlé management on implementing Creating Shared Value and assesses our progress. Council members also participate in Nestlé’s CSV Global Forum and form the judging panel for the Nestlé CSV Prize. Georg Kell is Chairman of Arabesque, an ESG Quant fund manager that uses self-learning quantitative models and big data to assess the performance and sustainability of globally listed companies. He is the Founding Director of the UN Global Compact, the world’s largest corporate sustainability movement with over 9,000 corporate and 4,000 non-corporate participants in more than 160 countries. Georg also oversaw the conception and launch of the Principles for Responsible Investment (PRI), the Sustainable Stock Exchange Initiative (SSE), and the Principles for Responsible Management Education (PRME). Mark R. Kramer is co-founder and Managing Director of FSG, a nonprofit consulting firm established in 2000 and specializing in strategy, evaluation, and research. As the primary overseer of FSG‘s consulting practice, he helps drive the vision and growth of the firm and leads engagements across all of FSG’s impact areas, with a particular focus on shared value. A prolific author, Mr. Kramer’s work is featured regularly in major publications, and he is a frequent speaker around the world on topics in catalytic philanthropy, collective impact, creating shared value for corporations, new approaches to evaluation, impact investing, and social entrepreneurship. He is the co-author of four Harvard Business Review articles with Professor Michael E. Porter of Harvard Business School. José Lopez is a senior leader with 36 years of general management and operational experience in the fast-moving consumer goods (FMCG) industry. Most recently, he held the role of Executive Vice President, Chief Operations Officer, at Nestlé SA, until his retirement in September 2015. His previous roles in the company include Chairman and CEO of Nestlé Japan Ltd and Managing Director of Nestlé Malaysia & Singapore. He has recently become a Fellow of the University of Cambridge Institute for Sustainability Leadership (CISL) and the Executive in Residence at IMD Lausanne. Prabhu Pingali is Professor and Director of the Tata-Cornell Agriculture and Nutrition initiative at Cornell University and Full Professor in Applied Economics. He has more than 25 years of experience in assessing the extent and impact of technical change in developing agriculture in Asia, Africa and Latin America. He was formerly the Deputy Director of the Agriculture Development Program at the Bill and Melinda Gates Foundation, Director of the Agricultural and Development Economics Division of the Food and Agriculture Organization (FAO), and earned a PhD in Economics from North Carolina State University in 1982. Ann M. Veneman has a distinguished career in public service. She served as Executive Director of the United Nations Children’s Fund (UNICEF) from 2005 to 2010, prior to which she was US Secretary of Agriculture from 2001 to 2005. She also served as Secretary of the California Department of Food and Agriculture from 1995 to 1999, overseeing the state agency responsible for the United States’ largest agricultural producing region. From 1986 to 1993, she served in various positions in the USDA, including Deputy Secretary, Deputy Undersecretary for International Affairs, and Associate Administrator of the Foreign Agricultural Service. Veneman’s leadership and vision has been recognised both nationally and internationally. In 2009 she was named to the Forbes World’s 100 Most Powerful Women list, and she has been the recipient of numerous awards and honours. In 2016 she received the Women Making History Award from the National Women’s History Museum. Veneman currently serves on a number of boards of directors, advisory councils, committees and non-profit boards. She is a frequent speaker on a range of topics including poverty alleviation, empowering women and girls, food security and nutrition and global health. Janet Voûte is the Chairperson of the Creating Shared Value Council and a member of the Board of Bupa (the British United Provident Association) as well as Bamboo Finance. Previously she was a member of the International Integrated Reporting Council and served as Global Head of Public Affairs at Nestlé. She also served as Partnership Advisor at the World Health Organization in the area of non-communicable diseases and mental health and as CEO of the World Heart Federation. She was formerly Vice President and Partner at Bain & Company. The Nestlé Nutrition Council (NNC) is an independent advisory panel made up of leading international nutrition scientists. It is instrumental in advising and challenging on the reviews of our research programs. The Council considers and advises our senior management team on nutrition challenges and their potential impact to Nestlé’s policies and strategy. It also organizes the Annual Nestlé International Nutrition Symposium.